Think of an SEO audit like tuning a race car. Only when every component of the engine is new, aligned and synchronized will the engine achieve maximum horsepower and efficiency. And, like an engine, your website can wear out and break down. Code and content can become obsolete. Unless you monitor the performance, you won’t know what’s wrong or how to fix it. Every business should perform an SEO audit at least once a year. An audit will uncover items that you’re not aware of that are happening deep inside the website. Broken links, on and off-page SEO, technical SEO will affect rankings and customer experience. If Google’s spiders and website visitors have an easy time finding pages and information, then you should also see an increase in organic traffic and a boost in your rankings. Here are the six steps and tools for a comprehensive eCommerce SEO site audit. As with any business building technique, planning is crucial. Compiling data can be time-consuming. SEO tools help make the work go faster and produce better results. Raven Tools is a comprehensive digital marketing tool that will perform an in-depth audit providing valuable data for a detailed competitor, link, keyword, and social intelligence. It integrates with other tools like SEOmoz, Majestic SEO, and SEMRush to crawl every area of the website uncovering any technical SEO issues along the way. It also efficiently manages tasks such as SEO, online advertising campaigns, and social media conversations. Other software that works well for site audits includes WooRank, Moz, SEMRush, AHREFS. SpyFu is an excellent tool to see how your competition ranks for keywords and if you are missing any profitable keywords. Once your business is set up with these tools, it’s fast and easy to manage. To save some time, look for the most significant issues first. However, only one domain name should appear. Redirect the others using a 301 redirect to the canonical version. Typically, the site crawling tool of your choice will display a list of pages and specific issues such as meta tags, content, links, speed performance, images and more. Reports generated from the tool will guide your team to the problem areas that require attention. Google Indexing Issues – If Google can’t index the website’s pages, there will be no ranking or traffic. You can use Google’s Search console or search any page using “ site: Search Term or Operator,” for example site:eventige.com. You should see the different pages returned as search results like you would with any Google search. Brand Name Ranking – Enter your brand name into a Google search. If it doesn’t comeback #1 result, there is a problem. Check On-Page SEO – Check to see that every page has only one H1 title, proper H2 and H3 tags, clickable title tag and a meta description. Duplicate Content – It could be an issue if another site is copying content directly from yours because your website also gets penalized. Other on-page errors can include a meta description that’s too short, an H1 title that’s too long or multiple H1 tags. By themselves, these issues are not horrendous, but numerous issues will drastically affect the page rank. You don’t have to attempt these tasks manually unless you’re just sampling a page. An SEO audit will uncover issues and list them quickly. Once the on-page issues are fixed, it’s time to bump up the traffic. You can use Google Analytics or your SEO tools to show you which pages draw the most traffic and what pages need improvement. Look for overall traffic trends and any noticeable spikes or dips. Dips can mean a problem with pages, or perhaps Google slapped the site with a penalty. The idea is to jump on repairing and solving for any issues once detected. Enlist the help of eCommerce search engine optimization services if you don't have the time to do it yourself. Keywords are the backbone of your SEO. Your SEO software should be able to generate keyword reports to see individual word rankings and whether they are trending in the right direction. One way is to employ SpyFu. It is a software tool that can tell you how your competitor’s keywords rank and if you should be targeting other profitable phrases. Regarding traffic, use Google Analytics or another SEO tool to find all the organic keywords that the site ranks in positions 5 to 10. These words represent high potential for increasing traffic. Boosting a keyword from position 5 to 3 can double a click-through rate. Moving to number 1 can increase CTR by seven times. Link building campaigns continue to increase future search traffic from Google. Inbound links to your site, a.k.a. link popularity has much more influence with Google rankings than on page SEO. Therefore, checking the quality of backlinks and improving them are essential tasks for improving rankings and traffic. According to AHREFS, having a quality URL backlink has ten times more correlation with Google Rankings as having the right keywords in the page title. Ask a search marketing firm to check your competitor’s links and determine which ones to duplicate. There are dozens of ways to build quality links from newsjacking to fixing broken links. Start by checking what you already have before deciding on a link building plan. If your competition is crushing it with a keyword that you aren’t using, that’s a content gap. Conduct an audit of all your pages to identify any missing or underused keywords. 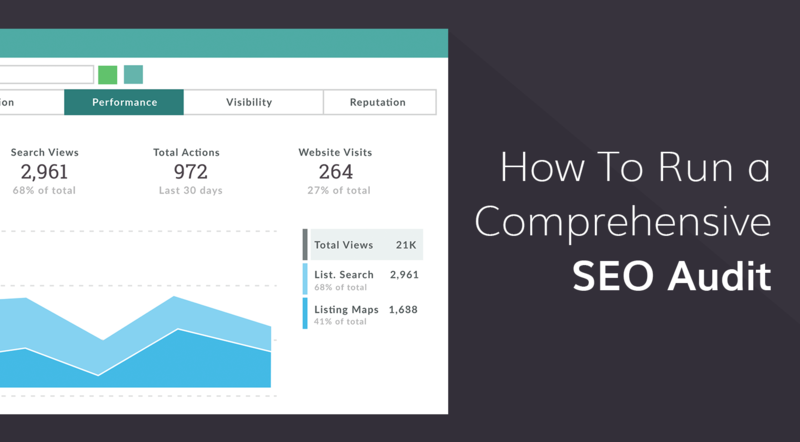 Under-performing pages can drag down your rankings. Add new content or delete the page. Like pruning a fruit tree, the fruit will come back healthier. Likewise, your rankings will improve by removing poor quality posts. If you do delete older pages, set up a 301 redirect to a new relevant page, to prevent losing any link equity. SEO site audits will highlight what needs to be done to improve your site rankings. You’ll be able to analyze and optimize for the best keywords throughout your site. An audit gives you a glimpse of what your competition is doing and how you can surpass them. Lastly, an audit gets deep under the hood and identifies all the technical issues that can make Google ignore or penalize your site and rankings.